After you create a website or WordPress blog the first thing you wanted is to buy best web hosting plan. Which can remain online 24/7 without any technical difficulties or errors. I hope you already know what is web hosting and why we use it ? Well, for the one who don't know, It is the cloud storage space where website or blog's are hosted. Buying hosting plan is not difficult, but new bloggers may found it difficult to choose which website hosting is best for them, which plan they need to buy etc. So, that's why I decided to write this tutorial to tell new bloggers what they need to know while buying hosting service. 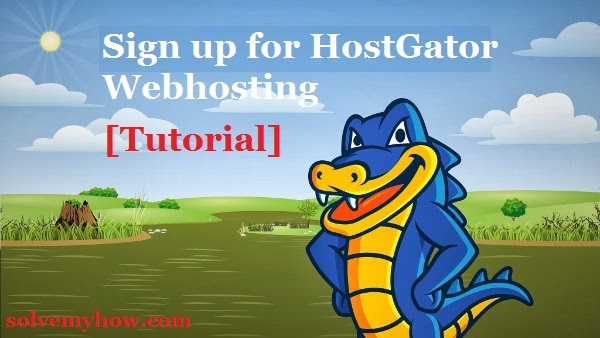 So, here I will be using HostGator Webhosting as an example because it is one of the best wordpress webhosting company. HostGator has already hosted 9 Million+ sites. So, that's why you can trust and buy hosting on HostGator. In this article I'll also share HostGator discount coupon so you can save lot of money while buying hosting plan. HostGator offers many plans but "shared hosting" / "shared plan" is best for new website's. 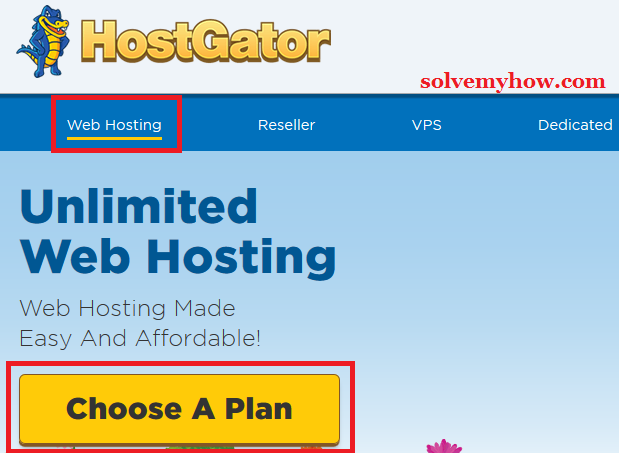 In this tutorial I'll buy HostGator's "baby plan" as it offers unlimited web hosting. I decided HostGator webhosting because I read lot of positive HostGator Review. Select "Web Hosting" and click on "Choose a plan". Step 2 :- Select HostGator hosting plan. I suggest you to select "Baby Plan" for 1 or more years and click on "SignUp now". step 3 :- Choose a Domain. Now, you will get 2 options - "Register a New Domain" or "I Already own this Domain". I hope you already have domain so go with the second option but in case if your domain registration is remaining then buy it from Godaddy.com or bigrock.com as buying domain from hostgator is pretty costlier. For now I am assuming that you have domain so select "I Already own this Domain" and enter your domain name. Step 4 :- Re-Check Hosting plan. Now you have to re-check the hosting plan. You can change hosting plan, duration etc. Here you have to enter your name and 4 pin security key which can be anything say for "1234". Step 5 :- Enter the billing info. Enter your genuine email address, name, phone no., etc and select payment method. You can either select credit card or paypal. Step 6 :- Additional Services. 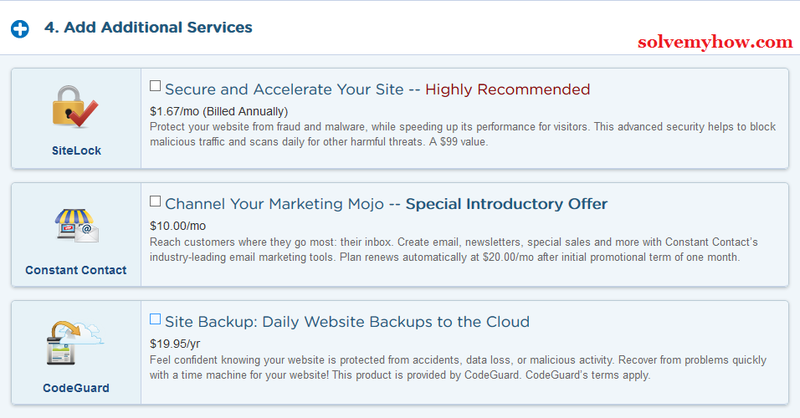 HostGator offers you so many additional services which are not necessary to buy. So, uncheck them all else it will increase your cost. Step 7 :- Enter a Coupon Code. 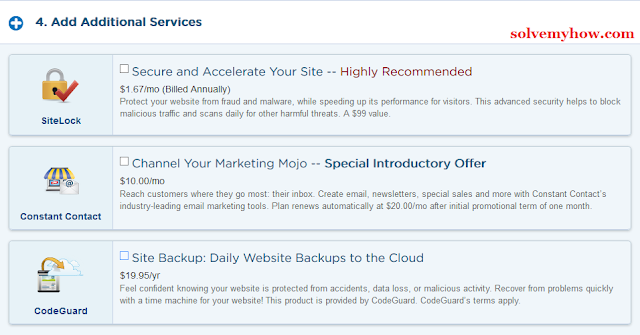 Here, for now you are getting only 20% HostGator discount. So to get more 25% discount enter "solvemyhow25". 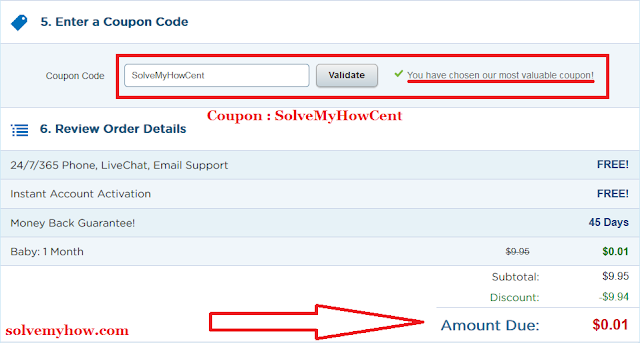 So, total you will get 45% discount with SolveMyHow. Now review your order details and click on check out. 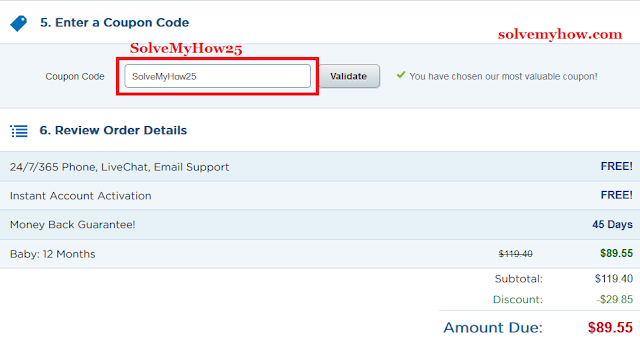 If you have selected PayPal as payment method then you will be redirected to paypal payment page. After successfully placing the order you will get a mail in the next minute or you might get a call too within an hour with your new hosting account details. P.S You can also try 1 penny / 1 cent ($0.01) for 1 month webhosting with hostgator. Just select "baby plan" for 1 month and enter HostGator promo code "SolveMyHowCent"
Sign up for free Premium webhosting for 1 month (Coupon : SolveMyHowCent) Give it a try, its free ! I hope this step by step guide will help you in purchasing hosting plan from hostgator. Though if you are confused and facing problems, feel free to let me know in the comment section below. Also, if you find this tutorial useful and informative, please share it with your Facebook, Google plus and twitter friends.